A couple of months ago, Colby Rasmus shared an interesting dance with Adam Wainwright. 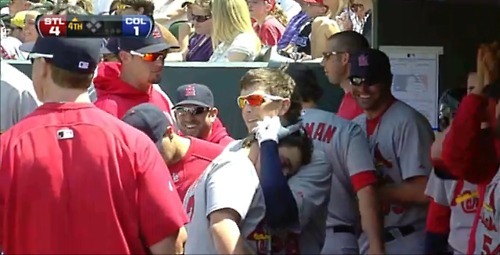 Has the St. Louis Cardinals center fielder found a new bromance with hot-hitting shortstop Ryan Theriot? This screenshot from the Cardinals recent trip to Denver speaks volumes. Theriot burned his former team, the Chicago Cubs, today with a game-tying, two-out double in the bottom of the 9th inning to extend his hitting streak to 19 games. His clutch hitting gave Albert Pujols the chance to smash a walk-off, extra inning home run for the second consecutive day. I wonder how they boys plan to celebrate. This entry was posted in Chicago Cubs, Infielders, LOL, Outfielders, Players, St. Louis Cardinals, Strange and tagged Adam Wainwright, Albert Pujols, Baseball, Center fielder, Chicago Cubs, Colby Rasmus, LOL, Major League Baseball, MLB, Ryan Theriot, St. Louis Cardinals. Bookmark the permalink.